Absolutely gorgeous direct ocean front unit. Professionally decorated 2 bedroom 2 bath located on the 6th floor. Bathrooms just remodeled with new fixtures, ceramic tile and granite countertops. Spectacular views. 70 minutes from Disney. 50 minutes from Kennedy Space Center. All linens included. Fully equipped kitchen. Large balcony with access from master bedroom and living room. Close to shopping and other attractions. Tennis and basketball courts are located onsite. Each bedroom has it's own private bathroom. Master bedroom has balcony overlooking the ocean and beach. Both bedrooms have a color TV with cable. Everything you need to cook and serve a homemade meal. We are a DIRECT Ocean Front unit. There is nothing between you, the sand and ocean. Just a quick trip down the elevator and you can have your toes in the sand! We arrived the Saturday before labor and stayed for a whole week in unit 103. We absolutely loved it!! It's a gorgeous, updated condo on the first floor. You open your balcony door and are steps from the pool and the beach! It's in a great location, near the sun glo pier, crabby Joe's and not far from the boardwalk. We cooked breakfast and lunch in the condo along with dinner 2 nights. We had everything we needed to cook. All appliances are updates and we did not have problems from anything. 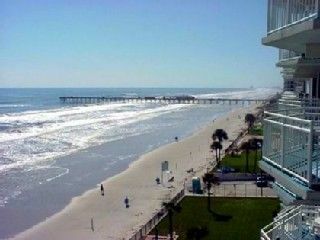 I would recommend this condo for people who love views, waves and spending all their time on the beach! We will definitely stay here again!! The condo was very nice. The only problem we had was I had specifically asked if the master had a walk-in shower. My 82 year-old mom was with us. Unforturnately, the walk-in shower was in the small, second bathroom. We made it work. The condo was very nicely decorated and had all necessities. We had to leave 2 nights early due to a medical emergency and had to leave towels in the dryer. Spoke with Sue, the owner, and she was fine with that. The dyer was a little hard to work with. It took well over an hour to dry a load of clothes. I dare say we might well stay in this condo on future vacations. It is in our preferred area with a lot of nice amenities. A hot tub would be nice, but that is a facility decision not an owner decision. My mom and I made very good use of the balcony. That is my favorite part of vacation -- sitting on the balcony watching the surf. Thanks for a great stay. We are glad to hear that you enjoyed your vacation and so sorry to hear that you had to depart early. We do hope things turned out ok. Thank you for bringing the dryer issue to our attention and it has been addressed. We are glad you felt at home and we look forward to your return. We do apologize for any miscommunication on the walk in shower .To clarify for future renters this specific unit the Master bedroom has a full size tub with a shower and the second bathroom has walk in shower. This condo was beautiful! Very clean and well maintained. everyone was very friendly and respectful. The views were absolutely gorgeous with the floor to ceiling windows in the living room and master bedroom. There was also a view of the river from the second bedroom. The unit was equiped with everything you would need for a beach vacation...right down to the boogie board and buckets/shovels! We loved it and would highly recommend it to any one who asked! Call or Email for Special Events, Holidays, Monthly rates and Last Minute Specials. These are NOT included in above rates. Add 12.5% tax and $85.00 cleaning fee. Rentals are Saturday to Saturday We also have 3 Bedroom units available, contact us for details.